Blog Who's the Most Important Person in Your Business? 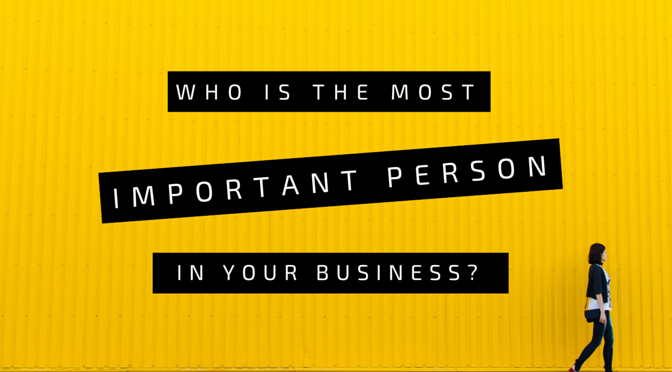 Who’s the Most Important Person in Your Business? She smiled. “I thought I noticed your name on the list. Do you want me to bring you a coffee over?” I vaguely recognised her, she’d been on shift when I’d visited before. But had she actually recognised me? I’d stayed at that particular Premier Inn (other budget hotel chains are available) about five times previously. Over five years. Out of precisely 1,826 days, Christine had seen me for approximately 100 minutes. On most of those days, she must’ve served more than 30 different people. And she remembered little old me. Yes, it’s entirely possible that the company had a customer database, and that each morning she was given a briefing on all returning guests. But she recognised me before I gave my name. Was this a one off? Had my dashing good looks and sparkling personality won me some special attention? To my ego’s disappointment, I was far from unique. As I sipped on my coffee, I watched as she warmly greeted every guest as they walked through the door, many by name. If a guest was on their own, she’d chat with them while they waited for their breakfast. Some would reply with single syllable grunts, but others would light up, discussing their life stories with this friendly stranger. She’d smile as people talked about visiting their family, or nod along as they explained their jobs. Then she’d move on, and greet the next person. Christine knew something that many businesses don’t. The most important person is always the customer. Without them, you don’t have a business. You have an expensive hobby. We live in an incredible time for entrepreneurs; it’s never been easier for anyone to set up an online business and start dealing with customers all over the world. We also have the ability to know more about our customers than ever before. Using analytics, you can learn so much about anyone who visits your website, from what country they’re in to what device they’re using. Google Analytics can also give demographic information for visitors, such as gender, age range, and interests. It’s not just websites. Email marketing software means that anyone can send personalised emails to specific segments of their mailing list. You don’t have to remember anyone’s name. Software will do that for you. Yet, in spite of all these (sometimes creepily detailed) tools, having someone show you genuine interest is now the exception, rather than the rule. For a long time now, business has migrated from the personal to the impersonal. We’ve gone from buying our food from local producers, to corner markets, to supermarkets, to online, without any human interaction required. In the past all your clothing would be tailored, hand made for you, but now we buy cheap clothing mass made on the other side of the planet. You can’t blame the businesses for this; supply and demand. Heck, I love being able to go on a shopping spree from the comfort of my own home. But one side effect is that for many businesses now, actual face to face interaction never happens. Visitors and customers stop being a name and become a number. A transaction ID. And when the numbers get big enough, it’s easy for the people behind them to disappear altogether. While big data can be a big advantage, businesses that show genuine interest in their customers will stand out. 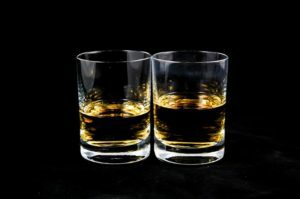 For traditional businesses that have regular face-to face contact with their customers, this is relatively straightforward. That doesn’t mean it always works out that way though. For example, you might think that a wedding photographer would be extremely familiar with their clients, and would do everything to make their special day special. But that doesn’t stop horror stories like the photographer who showed up for a couple’s wedding and took more photos of herself than she did of the happy couple. Still, it’s easier to treat your customer like real people when you can see them. For many of the people reading this though, you’re more likely involved in an online business. You may think that showing personal interest in your customers and clients sounds great, but it’s not so simple. You can’t create a Christine-bot and have her greet your site visitors. All the analytics in the world don’t automatically translate into meaningful relationships. Are we doomed to run businesses without soul? Back in the 90’s BT told us ‘It’s good to talk’ (I still remember the Bob Hoskins adverts. How’s that for effective advertising?). It’s as true now as it was then, but for businesses that never see their customers face-to-face, it may seem harder than ever. That’s why it’s important to make the effort to find your audience and talk to them. For sure, you want to keep on top of any queries or complaints, but don’t wait for these situations. Make time to talk to your customers. This can be done through social media, emails, telephone calls or actual face-to-face chats. The how isn’t important. The important thing is to find out what they want, and how you can help them. Help them, not sell to them. What’s that you say? You run a B2B outfit, selling to other businesses, not people? It’s a common sentiment that all businesses are run by robots, killing time until Skynet launches and takes over the world. Whilst you’d be forgiven for thinking that, you might be surprised to learn that most business are run by actual human beings. People with their own worries and concerns, hopes and dreams. People just like you. For example, my friend Jonathon Ogden is a business intelligence developer and software developer. If ever there was a job ideal for dealing with robots, he has it. Except Jonathon has built a reputation for getting to know his clients and their projects, a reputation for investing himself personally in the work he takes on. Because of that, he often knows what his clients need before they do, as well as how much they value being kept in the loop. As a result, his clients value him. There’s a reason he gets sent bottles of whiskey from happy clients. When Christine the waitress talked to the guests, she wasn’t only interested in what they wanted for breakfast, she was interested in them. She wasn’t trying to get people to upgrade their breakfasts for the next version up, she was trying to make sure they had the best start to their day. For her, they were the most important people. I’d love to give you a list of actions, a nice checklist for you to follow. ‘42 ways to connect with your customers.’ ‘1,024 ways to show your customers you care.’ But I don’t have that list. The truth is there’s a million ways to connect with your customers, but there’s only one principle. Treat your customers like real people, like they are the most important people in your business. Get to know them, and then help them. Not because they can give you money, but because everyone deserves to be treated like a human being. Have you had any experiences with businesses treating you like a real person? Or have you been left shocked at the lack of care? Share your thoughts in the comments. Hi, my name's Daniel and I love to write stories. My first thriller, tentatively titled 'Pain & Gain' is currently being revised and should be ready for publication later this year. Learn more about me here and sign up for updates above.